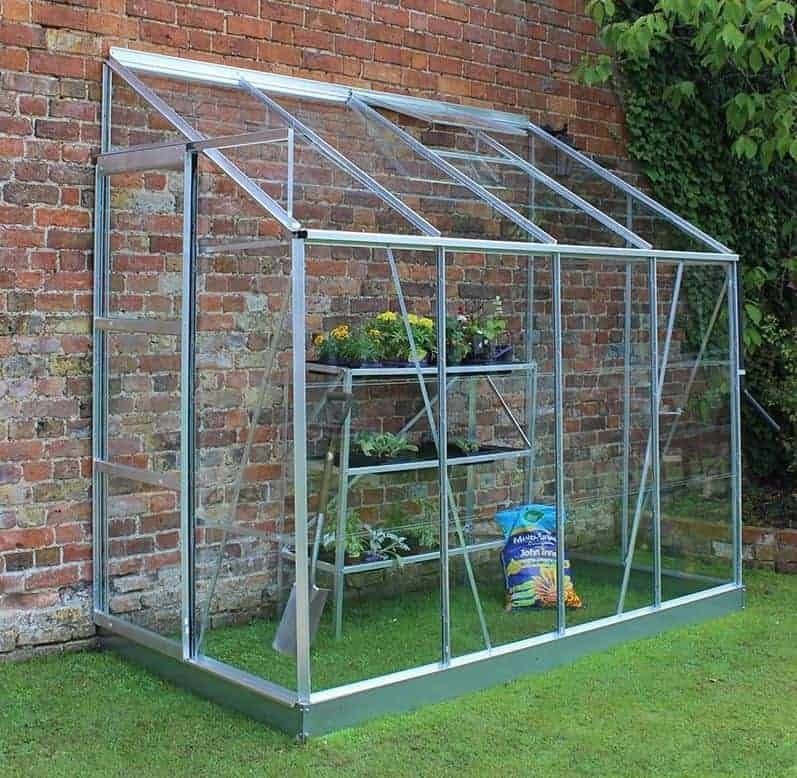 The modern looking 8’4 x 4’3 Halls Europa 84 Greenhouse is the perfect lean to greenhouse for those of you who love to grow food and take care of plants, but lack a large garden. Despite its somewhat compact size, this greenhouse still offers you plenty of room to work. With some staging and even shelving, you will have lots of room to play with. The impressive height means that you can even grow really tall plants inside of here. 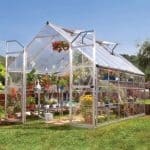 This greenhouse is great value and even at its low price it comes with an opening air vent. The sliding door is a fantastic feature that thanks to its impressive width makes getting in and out, even with your hands full very easy. While this is a greenhouse that is very low priced, the materials used in its construction are still very high quality. The panes are horticultural glass so as well as being rather strong they also ensure that the sun is going to give your plants and food all the nutrients they need. The framing that keeps the structure all together is made with some very lightweight, but also incredibly strong and robust aluminium framing. 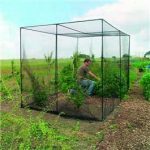 This is a lean to greenhouse that is very well made and it is going to give you many years of use and do it at a very reasonable price. Here we have the fantastic and well priced, 8’4 x 4’3 Halls Europa 84 Greenhouse. This lean to greenhouse gives you a very decent amount of space to move around and grow your plants and food. This greenhouse is a very impressive 8 feet 4 inches wide and 4 feet 3 inches deep. The 4 feet 3 inches may not sound like a lot, but with the use of some staging along the front of the greenhouse, you will have plenty of space to move around and work. The height of the greenhouse is 7 feet 3 inches along the ridge. This is an impressive amount of headroom and it will make walking around in here not require you to hunch over. Along the front of the greenhouse is 4 feet 9 inches of height. This is right about what we would expect there to be honest with you. The pent style roof they have used is mainly made from high quality horticultural glass and aluminium framing. The steep roof will always force the rain to run off at the front. The most surprising aspect of this roof was the opening vent. This is going to allow fresh air in the greenhouse and the fact one is included as standard at this price point is just fantastic. There is no cladding at all on this greenhouse. This is fine with us as we feel the aluminium it is made of is a great look. The lightweight aluminium framing that keeps this lean to greenhouse together is very impressive. The frame makes this very easy to install and it is so strong that even 20 years down the road, you will find that this kind of frame is just as strong as the day it was installed. Like other greenhouses of this style there is no floor included as you can see in the picture the idea of this is that you just install it up against your house, garage or even shed and use the ground. We feel that a concrete floor is the best, but grass or even decking will be fine. As there is no wood at all with the 8’4 x 4’3 Halls Europa 84 Greenhouse you do not have to worry about annual treatment. This is one very low maintenance lean to greenhouse and the aluminium requires no real care from you at all. The only thing you will want to do is give those glass panels a clean when they get a bit dirty to help get as much sun in the greenhouse as possible. 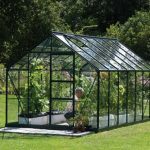 A one year manufacturer’s guarantee is included with this greenhouse. This may seem short, but as there is no wood, the glass is tough and the frame is low maintenance, you should not have any issues with this at all. We really like the door that they have used on the 8’4 x 4’3 Halls Europa 84 Greenhouse. It is a single door, but this sliding door still gives you 1 foot 9 inches of width. You should find this plenty of room to get your plants, food and tools in without any hassle at all. The door is made with the same glass and aluminium as the rest of the greenhouse. The horticultural glass they have used is actually very robust. It will keep things inside the lean to greenhouse nice and warm. They have used these large panels which will let in a lot of sunlight and also make the installation process a little bit easier as well. 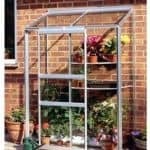 As there is no included lock with this greenhouse, you may not want to leave expensive tools or gardening equipment inside of here. These kind of doors do shut very securely so you do not have to worry about it sliding open in the wind. But still we do wish they had put some kind of lock on here as adding your own lock to an aluminium structure can be a bit of a pain in the rear end. As this is made with large horticultural glass panes, you are not getting much privacy with this at all. So if you do have any crazy genetically modified plants like the one from Little Shop Of Horrors living in here, you may want to hang up a curtain. Due to the materials that the 8’4 x 4’3 Halls Europa 84 Greenhouse is made from, you do not get any customisation options with it. This is not something we are too concerned with though as we feel that it has a pretty smart look just the way it is. There is only one extra for this lean to greenhouse and that is an auto opener for the air vent in the roof. While this is an extra that we would not say is essential in any way, it is still something we think is pretty cool and at £34.99 the price is actually very reasonable. This would make getting air into the greenhouse when it is needed that little bit easier. 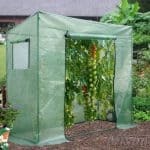 For a rather budget priced greenhouse this is actually very good quality. The glass they have used as well as the frame are very impressive and make this fare more high quality than it should be at this kind of price. This is going to give you a space to grow plants and food for many years. They have been very smart with the materials they have used and best of all this greenhouse will not require any maintenance from you. This is one of the smaller lean to greenhouses, but with the right kind of planning you can make this space go a long way. Its size does make it ideal for those of you without a lot of space in your garden. This should take you and the person you ask, bribe or kidnap no longer than 2-4 hours to install. This is a very straightforward installation job and we do not see anyone having any problems with it. We are very happy with the price they are asking for this. We feel they are asking a very fair price, considering the high quality of the materials they have used. Final Thoughts: The 8'4 x 4'3 Halls Europa 84 Greenhouse is one very impressive and low cost lean to greenhouse. We feel that the overall quality of this is very high and the use of aluminium framing and horticultural glass was very smart. We have no doubts that you will be able to get 20 or more years out of this greenhouse. The size may seem small, but we are sure with the right planning that you can make this space go very far. 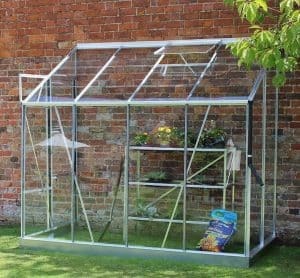 Also due to its rather compact size if you already have a greenhouse, but want to add another one for a bit extra space then this would be a very affordable way to do it. 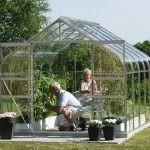 This is a great greenhouse and if you are in the market for a greenhouse, but have a strict budget then we highly recommend you at least consider this.